This is the first time I have featured a family of Plants twice in the plant of the week but as it is the Betula I hope you will all let me off! At this time of year, bark effect is coming to the forefront. As the leaves unveil the delights they have hidden away for the summer months, the stems, seemingly polished, appear from underneath. Their stems shine out on all our winters days, from those wet, dull horrid days when they seemly glow in the dark, shining out like lighthouses in the fog to the crisp sunny ones there they shine like polished metal in the sun. This tree is not native to the uk, indeed as the sinensis part of the name suggests, it is native to Western China where it grows between 1000-4400m above sea level in the temperate broadleaved forests. The Chinese red birch was first of all described from material collected by the French missionary Père Farges in 1899. It wasn’t introduced into Europe until one of the greatest plant hunters of all time, Ernest Wilson collected the seed and sent it back in 1901. His plant trips were sponsored by nurseries and also wealthy landowners, who would have a share of the seeds of plants collected on the trip and indeed the owners of Werrington Park in Cornwall, did just that and many years later, this form called Bowling Green was introduced. That tree grew to almost champion size and was also worthily of the great WJ Bean to include it in his great reference books ‘Trees and Shrubs Hardy in the British Isles’. A few of you may also recognise the plant featured in this blog as the one on the front cover o the Hilliers Guide to tress and shrubs. 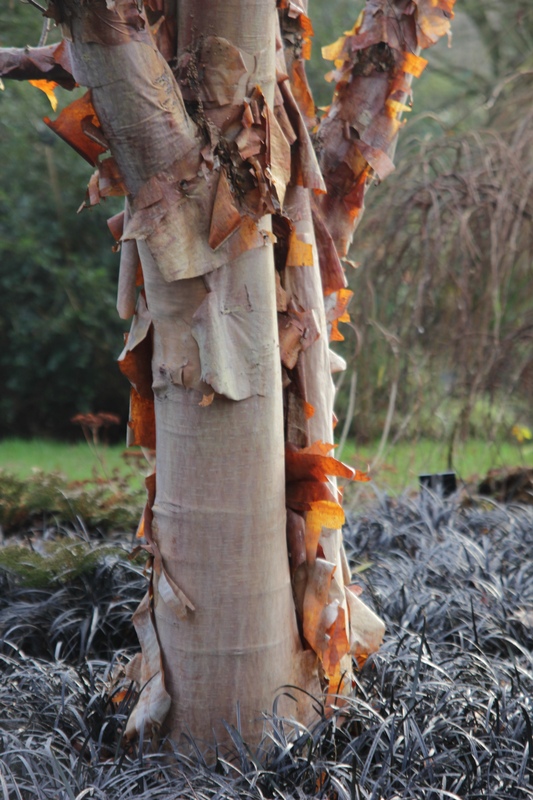 What makes Betula albosinensis so special is the colour of its bark, while most other birches are a mix of white, this one is a mix of pinks, bright orange and red, indeed into brown with a slight hint of cream, these different colours really do shine out in the winter light. In Latin, albo means white and it’s always confusing with this tree as nothing appears white apart from the sheets of thin bark has a whitish glaucous bloom underneath. It makes a smallish tree up to 10m in height and 6m wide. The leaves are a dark green colour on top and have a slight greyish underside, they turn a lovely yellow colour in the autumn. The catkins, borne in April are quite stunning and can reach about 10cm in length. It can take most soils types from chalk to clay and unlike other forms of birches, it doesn’t mind drying out a little during the summer. When planting a young tree, it’s well worth adding lots of good well rotten compost with both mycorrhizal rubbed into the roots and Vitax Q4 fertiliser around the planting hole. It requires very little pruning just a little shaping. Pest wise, the worse one is the damn sawfly, who’s horrid little caterpillar will strip the tree of all the leaves within days, so watch out for it! Betula albosinensis ‘Bowling Green, can be brought from PanGlobalPlants and BlueBell Nurseries. Gardenwise, I have only seen it at Sir Harold Hillier Gardens but would also think it would be at Wakehurst As part of the National Collection of Birch that currently grow there. Next post: New on the site! If you don’t feature plants of the same family once a while, you will run out. I have actually featured some of the same plants more than once over the years. Of course, I have limited space to write, so I can write different information each time. It helps if you feature unusual plants as well. I tend to limit most of mine to plants that are somewhat common and available, which means that there are less too select from.